The Talent Management Expert—Strategy. Execution. Results. Through our exclusive partnership with Development Dimensions International (DDI), we offer the most comprehensive set of tools and skills for needs assessment, hiring and selection, and leadership development. For some companies breakthrough technology fuels their growth. For others, it is enhancing customer loyalty or successful entry into emerging global markets. But for all companies, the one priority that stands at the very top is talent. With it, everything is possible. Without it you can count on one failed business strategy after another. It’s little wonder that three quarters of senior executives who participated in a recent DDI-Economist study listed talent as their most critical business imperative—above all others. Using our world-class learning systems, organizations are developing more than 250,000 better leaders each year. More than 3,200 high-quality hiring decisions are made every hour and 20,000,000+ candidates have been successfully screened using our behavioral interviewing, testing and assessment systems. Major corporations make crucial promotion and placement decisions for more than 3,000 senior executives each year using our assessment process—in Singapore, Beijing, London, Mumbai, New York and hundreds of other locations around the world. The numbers are just part of the picture. In an independent survey of senior HR executives, DDI is at the very head of the list of major talent management competitors in terms of breadth of our solutions, our levels of expertise, the quality of our people and services. 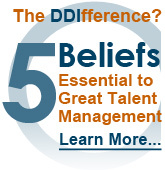 DDI has a comprehensive, yet practical, approach to talent management. It’s been a successful blueprint for many clients because it brings together all of the major strategies, processes, and activities required to systematically manage an organization’s talent. We bring the deepest, broadest and freshest experience, programs and technology to the table to ensure a successful and sustainable talent management plan. We believe that a sound talent strategy starts with a clear picture of the business outcomes you expect and defining the talent you will need to achieve the outcomes. DDI will work with you to: pinpoint current and future business drivers; define how success will be measured; identify gaps in the quality and quantity of talent required to execute your business drivers; pinpoint strengths and weaknesses in your current talent management systems and capabilities; and deliver a strategy aimed at closing your talent gaps. Choosing the right talent management initiatives and implementing them well is just half the battle. The other half is making it all stick. Our systematic approach to execution can help you achieve the results you need for your talent—and your organization. We help organizations execute talent strategy through: clear and ongoing communication to all stakeholders about what you are doing and why; a relentless focus on clear accountabilities; aligning your talent initiatives with systems such as rewards, recognition, and compensation to drive results; and putting a measurement process in place. You need to paint a target before you can aim for it. A clear picture of what defines a successful performer will help ensure you hire, promote, develop, and retain more of them. 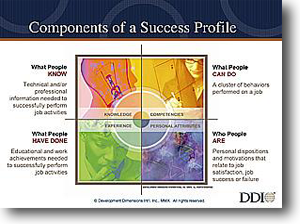 DDI’s competency management and job analysis services help you create a more complete Success ProfileSM of the ideal performer. SuccessProfilesSM go beyond competency modeling. They also define the knowledge, experience and personal attributes critical to success on the job. The data that you get from Success ProfilesSM will serve as “glue,” integrating every component of your talent management system. They will guide hiring and promotion decisions, setting performance expectations, and targeting development activities. What can DDI do for you? Align your Success Profiles to your organization’s business drivers with our unique Card Sort approach to job analysis. Improve the accuracy of your competency modeling process with access to our comprehensive competency library and thousands of job analyses conducted by DDI. Every organization runs on talent, relying on its people to execute business strategies. Does your organization have the right talent to succeed? Answering that question means first knowing what success looks like in your company. DDI’s Success ProfilesSM offer a comprehensive job analysis and competency modeling system that lets you quickly and accurately identify the competencies and motivations needed for successful job performance. A clear understanding of what defines a successful performer will assure you hire, promote, develop and retain more of these top performers. A streamlined process for getting to the right profile quickly. Identification of four characteristics that describe the ideal candidate—work experience, knowledge and skills, personal attributes and competencies. A business-focused description of performance that operational users will adopt as a tool to drive performance. Documentation of the profiling process and outputs to provide a legally defensible foundation for hiring and promotion. DDI offers two Success ProfilesSM solutions to meet your organization’s competency modeling needs—Success Profiles: Navigator® and Success ProfilesSM: Card Sort. Success Profiles: Navigator software automates the competency modeling process from research through confirmation. The system allows you to incorporate data from multiple job analysis techniques to create the most complete picture of the job possible. Additionally, Success Profiles: Navigator documents every step of the process, enabling you to easily return to the profile to make updates as your business changes. Learn more about Success Profiles: Navigator here. No amount of development will make up for a poor hiring or promotion decision. DDI offers the most comprehensive range of employment testing, assessment and behavioral interviewing tools in the world—tools that are used to assess more than 4.5 million people each year. A full range of leadership/executive assessment and other evaluation tools to guide individual development and make key placement and promotion decisions. Assessment can be at one of our 29 acceleration centers, your facility or online. Recognizing that you may already use a particular candidate management system but need to bolt on quality tools to improve the process, DDI can integrate its testing and assessment technology with most Applicant Tracking systems. DDI’s comprehensive talent acquisition solution, AcqHire®, is built on more than 37 years of helping organizations around the world meet their talent needs and build a competitive advantage through their human capital. AcqHire® is a totally integrated, end-to-end solution that helps you make more accurate, cost-efficient hiring and promotion decisions. Whether you need 1 component or the whole suite, AcqHire® can bolster your existing hiring processes and help you meet the talent challenges of your specific industry or job family’s. A big part of talent management is acquiring the talent your organization needs to carry out its business strategies. That means hiring the right people with the right skills at the right time. DDI’s Targeted Selection® (TS®) allows you to do just that. TS is the world’s most proven, accurate behavioral interviewing system. But it is so much more than that. TS provides recruiters and hiring managers with the resources and skills they need to hire and retain top talent. At the same time, TS is highly flexible, offering several workshops, certifications and learning modalities to help you realize the results you want for your organization in a way that works for you. Hones recruiters’ and hiring managers’ interviewing skills to make the right hiring and promotion decisions. Prevents interviewers from veering off course and asking invalid – or worse, illegal – questions. Leaves candidates with a favorable impression of your company. Enables your organization to train your own staff on behavioral interviewing techniques. 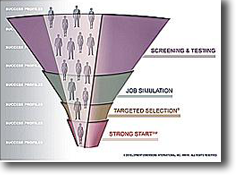 Incorporates behavioral interviewing as a consistent part of a validated talent acquisition system. Enhances candidates’ positive perceptions of your organization. Improves retention by helping you select people who are engaged and who will be a good fit within your organization. Includes additional courses to enable your interviewers to gather information on specific technical skills, sell the job to the candidate and get new hires off to a strong start. Talent management becomes more effective with a clear picture of your executives’ strengths, derailers and development priorities. Whether you are interested in sending your leaders to one of our 29 Acceleration Centers® across the globe or prefer technology-enabled administration, our best-in-class tools identify leadership potential, support personality profiling, offer rich insight for development and benchmark executive performance against unique business drivers. DDI’s configurable simulation platforms and global leadership inventories enable a holistic evaluation of your leader’s competencies and potential shortcomings against targeted organizational levels (e.g., strategic executives, operational executives), industry/functional segments (e.g., health care executives, sales executives) and changing business paradigms (e.g., turnarounds). The move from an individual contributor to a leadership role marks a critical and challenging career transition. Many people who are outstanding in their functional area prove to be less than successful leaders when it comes to motivating, developing, and retaining top talent. For new leaders (and their organizations) the stakes are enormous. They need to be accountable for their own performance and to drive and leverage others’ performance. Since first-time leaders must exhibit a set of new leadership skills, organizations often lack meaningful data with which to make the best selection decisions. Highly predictive results minimize the risk associated with selection and helps accelerate the development of leaders. Through our partnership with DDI, we offer Assessing Talent: People LeaderSM —a web delivered behavioral assessment program—an excellent tool for hiring and promotion decisions, and development of future first- & second-level leaders and current leaders. The program accurately evaluates participants’ skills and readiness in managing a work unit and motivating, developing, and retaining talent. The assessment activities in this program are particularly effective in helping companies diagnose the development needs of their leaders prior to implementing a training program. The Assessing Talent: People LeaderSM program is a totally modular system, allowing clients to select the components most relevant to their first- and second-level leadership positions. The components in the program are set up in a day-in-the-life format so that your leaders go through roleplays that emulate interactions that typically occur on the job. The core program assesses proficiency in areas critical to leadership effectiveness. Additional components could then be added to supplement the core program as needed by the organization. Learning may start in the classroom—or online—but it must continue on the job. DDI provides relevant and challenging learning experiences for all levels from individual contributors and front-line leaders to mid-level and senior-level leaders. More importantly, we help to ensure that newly-learned skills are put to use from first day back on the job. Leadership Mirror® is a multisource, multilingual 360° feedback system. Web-based and flexible, it allows you to implement standard or customized 20-30 minute surveys based on organizational needs. For organizations, it’s a powerful way to measure the impact of leadership development as it provides a deeper understanding of strengths and developmental needs. For participants, results spur performance improvements through actionable suggestions and support tools. Choice of two survey styles: Traditional Feedback or Targeted Feedback®. Seven standard surveys, including Fundamentals of Leadership, Nine of Roles of Strategic Leader, and Sales Executive. Or customize a survey based on your organization’s competencies. Easy-to-interpret reports that display strengths and development needs of individuals or groups. Fully web and email enabled. Standard Windows® environment. Can be accessed over the Internet or intranet. What’s driving the success of your business? Aggressive top-line growth? Entering new global markets? Launching the next blockbuster product? Whatever it is, success hinges on flawless execution. And flawless execution hinges on the leaders you have driving it. DDI’s new development system, Business Impact LeadershipSM equips your leaders with the skills they need to meet your organization’s ever-changing demands. Business Impact LeadershipSM: Mid-Level Series offers a suite of high-impact courses specifically designed for mid-level leaders. These “make it happen” leaders are charged with steering the organization where senior executives determine it should go. But many have been struggling to keep up. Business Impact Leadership: Mid-Level Series gives them the skills and tools to meet their mandate and drive successful strategy execution. Business Impact LeadershipSM: Senior-Level Series enables your organization to create continuous learning experiences for your executive level linked directly to business needs. Our consultative approach to executive development is known not only for addressing specific individual and executive team leadership gaps, but also for increasing speed-to-productivity and ultimately driving organizational transformation. As the talent management experts, we know what makes mid- and senior-level leaders successful. We understand the challenges they face and the critical responsibility they have in creating and executing business strategy. We have applied this knowledge to create unique experiences at each level that will give your leaders the skills they need for exceptional performance. Competitive organizations need people driven to stay longer, try harder, accomplish more, and take pride in their work. That takes great leaders and teams. DDI’s Interaction Management® (IM®) system is a competency-based leadership and workforce development system that addresses contemporary challenges your individual contributors, team members, team leaders, managers and supervisors are facing. How? More than just a set of courses, IM includes diagnostics, management support, on-the-job learning, performance support, and evaluation services. Flexible and accommodating, IM integrates with a full range of other DDI leadership capabilities. This training is designed to get your leaders and teams back on the job faster armed with the skills, plans, and tools they need to make immediate impact. IM contains two series: Interaction Management®: Exceptional Performers series (IM: ExPSM)for your individual contributors and team members, and Interaction Management®: Exceptional Leaders…Extraordinary Results® (IM: EX®) for your frontline leaders. Job aids, management support tools (for the leaders of the learners), discussion planners, and electronic add-ons designed for immediate on-the-job application. Flexible delivery options: traditional and virtual classroom, web-based training, and blended learning. Training certification of your staff or delivery by a DDI-certified facilitator. Consulting services for implementation planning. Evaluation and measurement tools for pre- and post-training evaluation. DDI’s IM: EX training programs are available in 21 languages including English (U.S. and Anglicized), French, German, Spanish, and Mandarin (simplified and traditional). IM: ExP series is only available in English at this time. In addition, DDI is committed to working with clients to meet specific language requirements. Performance management is the greatest catalyst to successful talent management and it is often the most poorly implemented. Done well, it enables the execution of business strategy by creating alignment, accountability and focus. Executing Business StrategySM —A custom working session that guides leaders through an effective and proven execution process for turning strategies into results. Maximizing Performance®—High-impact training that gives managers and their team members the skills to set and gain commitment to both the “what’s” (measurable goals and accountabilities) and the “how’s” (competencies), and ensures they are linked to overall business goals. Managers also learn to evaluate behavior and conduct meaningful performance reviews. Establishing lead and lag measures for charting performance progress. Building employee passion and commitment to action. Aligning cross-functional systems and resources. Today’s health care organizations need a performance management system that drives focus and clarity by linking individual performance to strategic priorities and organizational values. Maximizing Performance® for Health Care helps create a high-performance workforce by training everyone, from senior executives to the front line, on how to align their performance with the organization’s vision, values and strategic priorities. Is based on proven, legally credible performance management best practices, and is consistent with JCAHO standards. Provides powerful content for online systems to ensure that your technology investment pays off. Allows you to leverage a health care-specific case study, video and skill practices. You can also easily tailor the system to fit your organization’s needs, language and business strategies. Enables your organization to use health care competencies to integrate performance management with other HR systems (i.e., selection and assessment, training and development, career and succession planning, etc.). Succession Management – Who’s Next? When your CEO asks “Who’s next?” will you know? Succession management is about continually developing and moving talent over time. It’s about having leaders who are ready today to meet your business needs of tomorrow. Identifying leadership potential early on using a set of validated criteria. Workforce and leadership development programs, including establishing acceleration pools for rapidly developing high potentials to assume higher and more complex roles. Strategic Talent Reviews, part of our Assessing Talent® process, provide comprehensive feedback and recommendations to executives on readiness of individuals and teams to move into critical roles and address future challenges. Expert succession management consulting services to enhance the quality of your succession management system design. A full range of executive assessment tools to guide individual development and make key placement and promotion decisions. Assessment can be at one of our 29 acceleration centers at your facility or online. Executive Team Services that help top management teams improve synergy and collaboration to meet strategic challenges.